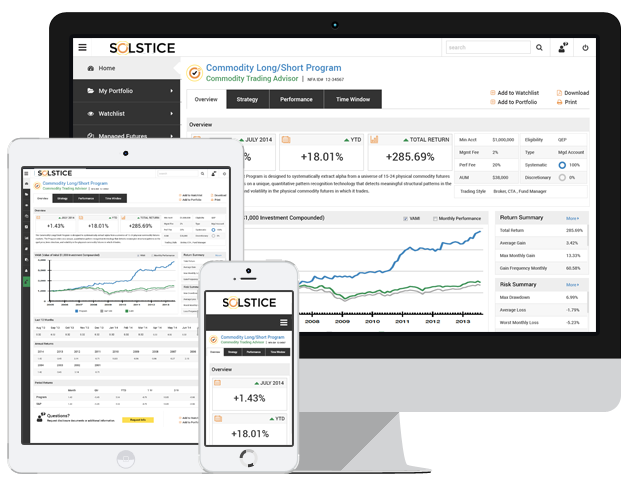 Access Commodity Trading Advisor (CTA) performance results and create a hypothetical portfolio of managed futures programs and see how you can diversify your portfolio. Review the various types of managed futures managers trading a diverse set of products from stock indexes and foreign currencies to agricultural products, metals, and energy. See a program you’re interested in? Save it to your Watchlist for easy review. Data is clearly presented with charts and tables in an easy-to- read format, even on mobile phones. Which managed futures program is right for you? Not sure where to start? A licensed futures professional will assist you with developing a managed futures portfolio. Are you a Qualified Eligible Person? PLEASE READ THE FOLLOWING STATEMENT THE RISK OF LOSS IN TRADING COMMODITIES CAN BE SUBSTANTIAL. YOU SHOULD THEREFORE CAREFULLY CONSIDER WHETHER SUCH TRADING IS SUITABLE FOR YOU IN LIGHT OF YOUR FINANCIAL CONDITION. THE HIGH DEGREE OF LEVERAGE THAT IS OFTEN OBTAINABLE IN COMMODITY TRADING CAN WORK AGAINST YOU AS WELL AS FOR YOU. THE USE OF LEVERAGE CAN LEAD TO LARGE LOSSES AS WELL AS GAINS. IN SOME CASES, MANAGED COMMODITY ACCOUNTS ARE SUBJECT TO SUBSTANTIAL CHARGES FOR MANAGEMENT AND ADVISORY FEES. IT MAY BE NECESSARY FOR THOSE ACCOUNTS THAT ARE SUBJECT TO sfsTHESE CHARGES TO MAKE SUBSTANTIAL TRADING PROFITS TO AVOID DEPLETION OR EXHAUSTION OF THEIR ASSETS. THE DISCLOSURE DOCUMENT CONTAINS A COMPLETE DESCRIPTION OF THE PRINCIPAL RISK FACTORS AND EACH FEE TO BE CHARGED TO YOUR ACCOUNT BY THE COMMODITY TRADING ADVISOR ("CTA"). THE REGULATIONS OF THE COMMODITY FUTURES TRADING COMMISSION ("CFTC") REQUIRE THAT PROSPECTIVE CLIENTS OF A CTA RECEIVE A DISCLOSURE DOCUMENT WHEN THEY ARE SOLICITED TO ENTER INTO AN AGREEMENT WHEREBY THE CTA WILL DIRECT OR GUIDE THE CLIENT'S COMMODITY INTEREST TRADING AND THAT CERTAIN RISK FACTORS BE HIGHLIGHTED. THIS DOCUMENT MAY BE AVAILABALE AT THIS SITE. YOU WILL NOT INCUR ANY ADDITIONAL CHARGES BY ACCESSING THE DISCLOSURE DOCUMENT. YOU MAY ALSO REQUEST DELIVERY OF A HARD COPY OF THE DISCLOSURE DOCUMENT, WHICH ALSO WILL BE PROVIDED TO YOU AT NO COST. YOU ARE ENCOURAGED TO REVIEW THE DISCLOSURE DOCUMENT BUT TO BEAR IN MIND THAT IT IS A BRIEF STATEMENT THAT CANNOT DISCLOSE ALL OF THE RISKS AND OTHER SIGNIFICANT ASPECTS OF THE COMMODITY MARKETS. THEREFORE, YOU SHOULD STUDY THE DISCLOSURE DOCUMENT CAREFULLY TO DETERMINE WHETHER SUCH TRADING IS APPROPRIATE FOR YOU IN LIGHT OF YOUR FINANCIAL CONDITION. IN LOOKING AT CTA PERFORMANCE FIGURES, PLEASE BE AWARE THAT PAST PERFORMANCE IS NO INDICATION OF FUTURE PERFORMANCE. INFORMATION AVAILABLE ON THIS SITE DOES NOT CONSTITUTE A SOLICITAITON OF ANY CTA. THE CFTC HAS NOT PASSED UPON THE MERITS OF PARTICIPATING IN ANY TRADING PROGRAM NOR ON THE ADEQUACY OR ACCURACY OF THE DISCLOSURE DOCUMENT. PLEASE NOTE THAT ANY CTA SHOULD BE JUDGED ONLY ON THE MERITS OF THE MATERIAL THEY SUPPLY YOU AND ON OUR OWN DUE DILIGENCE. RJO TAKES NO RESPONSIBILITY FOR THE PERFORMANCE OF ANY CTA. OTHER DISCLOSURE STATEMENTS ARE REQUIRED TO BE PROVIDED TO YOU BEFORE A COMMODITY ACCOUNT MAY BE OPENED FOR YOU. THE PERFORMANCE INFORMATION AND OTHER DATA PRESENTED IS PROVIDED BY EACH INDVIDIAL CTA. NO PERFORMANCE INFORMATION OR OTHER DATA HAS BEEN AUDITED BY R.J. O’BRIEN FUND MANAGEMENT, INC. PLEASE ACKNOWLEDGE YOUR UNDERSTANDING OF THE ABOVE STATEMENT BY CLICKING ON THE BUTTON BELOW. YOU MAY THEN CONTINUE TO VIEW THE SITE. I UNDERSTAND THAT PAST PERFORMANCE IS NOT INDICATIVE OF FUTURE PERFORMANCE AND THAT ANY CTA SHOULD BE JUDGED ONLY ON THE MERITS OF THE MATERIAL THEY SUPPLY ME AND MY OWN DUE DILIGENCE. I ACCEPT THAT [BROKERNAME] TAKES NO RESPONSIBILITY FOR THE PERFORMANCE OF ANY CTA. I ACKNOWLEDGE THAT THIS INFORMATION DOES NOT CONSTITUTE A SOLICITATION OF ANY PARTICULAR CTA. THIS MANAGED FUTURES DATABASE IS NOT A COMPLETE LIST OF ALL OF THE COMMODITY TRADING ADVISOR PROGRAMS AVAILABLE. UNLESS OTHERWISE INDICATED,ALL OF THE DATA IN THIS DATABASE IS REPORTED BY THE MANAGER DIRECTLY AND HAS NOT BEEN VERIFIED FOR ACCURACY. THE WEBSITE CONTAINS DATA FROM NON-INVESTIBLE INDEXES FOR RESEARCH PURPOSES ONLY. ALL INDEXES ARE COPYRIGHT THEIR RESPECTIVE OWNERS AND ARE USED WITH PERMISSION. Past results are not necessarily indicative of futures results. Trading futures and options involves the risk of loss. You should consider carefully whether futures or options are appropriate to your financial situation. You must review the customer account agreement and risk disclosure prior to establishing an account. Only risk capital should be used when trading futures or options. Investors could lose more than their initial investment. The risk of loss in trading futures or options can be substantial, carefully consider the inherent risks of such an investment in light of your financial condition. Although it is believed that the information provided is accurate, no guarantee is made. COMPANY NAME assumes no responsibility for any errors or omissions. Information contained, viewed, sent or attached is considered a solicitation for business.